It’s good to introduce the nursery rhymes, poem and songs to our kids because they provide a fun, active, playground for phonemic awareness(the ability to hear the sounds and distinguish between them in the English language) – a research highlighted predictor of reading success. Soo back to this activity is very simple to make. 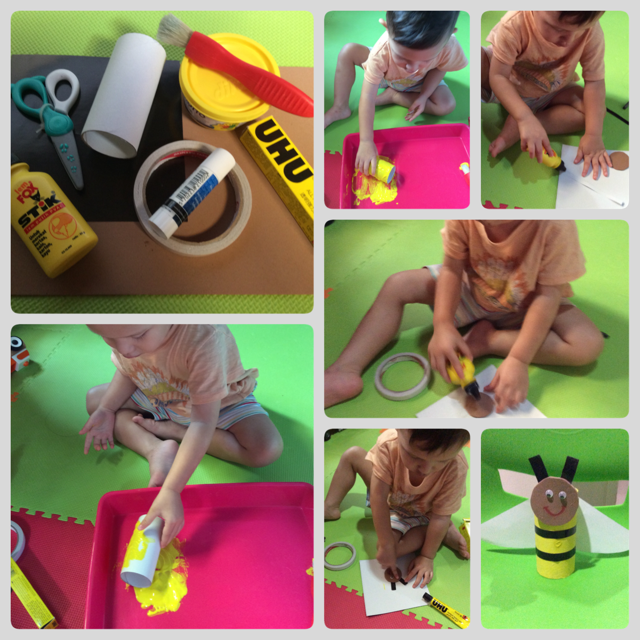 Ask your child to roll the toilet paper into the yellow paint (this is the fun part of a sensory experience). Cut two/three strips of black construction paper. Glue them around your yellow bee body. Cut out a heart shape with the white paper. Turn it upside down and glue it onto the body. These are the wings of your bumble bee. Cut a head out of the brown foam artpaper. Now, we need some antennae too! Cut these out of black construction paper and put it on its head. Don’t forget the eyes! You can also make the nose and the smile with a marker. Glue the head onto its body. Let’s give it a try and I hope you will have a great quality time with your kids.